Wet or Dry in Libertyville? On June 26, 1913, Illinois Governor Dunne signed the Illinois Municipal Voting Act granting Illinois women the right to vote for Presidential electors, all local offices not specifically named in the Illinois Constitution and on any “local option” issues. 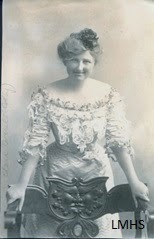 Clara Colby of Libertyville became the first woman in Illinois to cast a ballot under the new law by voting in a July 5, 1913 election seeking approval to take out bonds to build a new village hall. 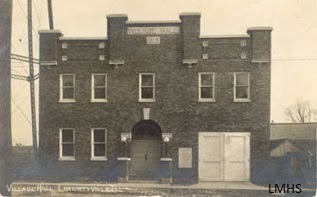 Mrs. Colby’s vote and the votes of other Libertyville women carried the election and construction on the new village hall was approved. This was just the beginning of the influence of the women’s vote in Libertyville elections. 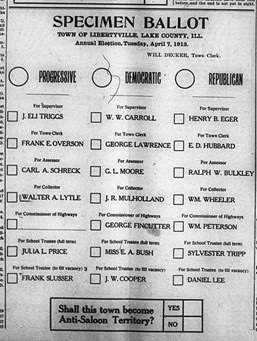 In early 1914, effort began in earnest to place a local option issue on the ballot for the April election. The question to be answered by the voters of Libertyville Township was “Shall this town become Anti-Saloon Territory?” or, should Libertyville ban the sale of alcohol and become a “dry” town. 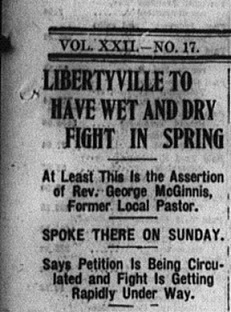 At a January 4 meeting, the Reverend George McGinnis, an officer of the Illinois Anti-Saloon League, predicted that Libertyville would be the site of one of the fiercest wet/dry battles in Illinois and that it was likely that women’s votes would push through the dry agenda. Needing 127 petition signatures to put the issue on the ballot, the local dry supporters gathered 159 signatures. The wet/dry battle in Libertyville was on. The Dry forces did not rest on election day, April 7. A thorough canvas was made of the country districts; cars, surreys, buses and single rigs were used to bring farmers and their wives to town to vote. The ladies rest and instruction room in the Jochheim bakery building was besieged all day by women seeking direction on how to mark ballots. Total dry – 653, total wet – 539. Libertyville was to become a dry town by a 114 majority. Had women not voted in this election, the men’s votes would have assured Libertyville remained a wet town. The Wets immediately filed a protest claiming that women were instructed right at the polling station and friends stepped in to the booth to help. Their biggest argument was that since the Illinois Supreme Court had not yet ruled on the constitutionality of the Illinois Municipal Voting Act, all of the votes cast by women were illegal and should be thrown out. Ultimately, the Illinois Supreme Court upheld the Illinois Municipal Voting Act and the election results stood. The six saloons in Libertyville were forced to cease business and the sale of alcohol became illegal. The Wet/Dry issue was once again on the ballot in 1916. This time the men’s majority was also in favor of a dry town. Libertyville remained dry until the end of National Prohibition in 1933.